The first rule of Soup Club it seems, is to make tasty food once a month for your friends, share it out, and to make sure everyone has their soup containers back. This book is based around four friends in New York City, and their desire to eat home-cooked food, but not have to cook it themselves all the time. One week in four, one of the group will cook up a massive batch of something (generally soup – it is a soup club after all, and soup is pretty transportable), and share it out between the four. Scaled up soup production doesn’t really involve a massive amount of extra time, just a much bigger pot! I don’t really envisage myself as being part of a soup club here, at least not right now, but when looking at the details of the book, and examples of recipes it looked interesting, and full of lots of ideas for recipes that Mr M could have for lunch (he has gone through the entire repertoire of his local sandwich shop already, and I think is a bit bored!) So is it just a book full of soup recipes? No! It has toppings! And accoutrements! Such as your basic croutons, grilled cheese croutons, or some chili-lime pepitas, but also some side dishes such as cheddar cornbread, black olive shortbread, and spinach polenta. It is a definitely more of a gourmet soup experience, along with salads and some bigger dishes such as chicken wings, stews, and lasagna, but all created using ingredients that you can find in any old store, using simple techniques and equipment, so what I really enjoyed was the accessibility of the recipes. 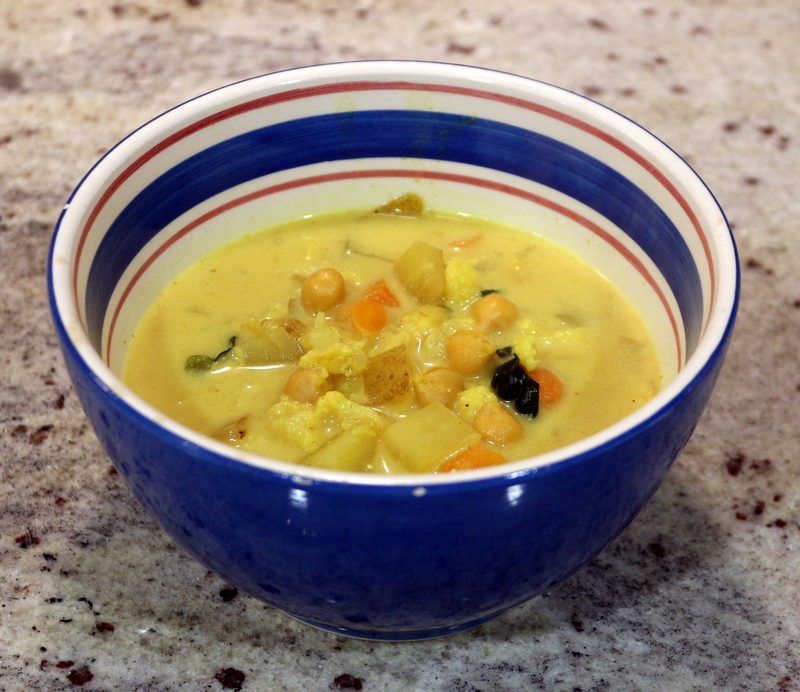 I thought I should try at least one of the recipes before I gave a verdict, so picked the Cauliflower Korma soup: …and it was delicious.I had to go buy some cauliflower, kale, potatoes, carrots, cream, and yogurt, but otherwise it all came together using spices and other ingredients that I already had on hand. 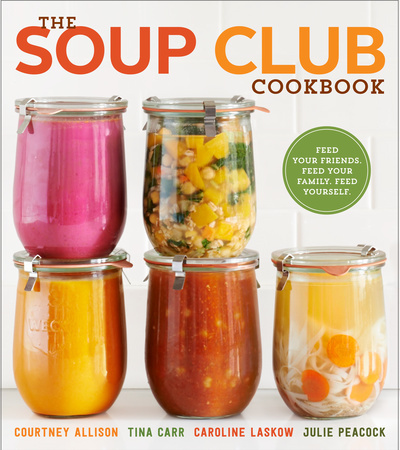 The main thing to remember is that unless you have a family of 20, the book is designed for a soup club, so is four families’ worth of a meal. If you are just making food for one family, you will need to reduce the amount made accordingly. I made the above recipe in quarter quantities, and fed three hungry adults, with 3 lots of leftovers for the freezer/lunch the next day, and I didn’t even make the rice to accompany it! The only thing is, I now feel like I need some stylish blog-worthy Weck jars to keep my soup in so……… 🙂 You want your own copy? See more details here, or of course it is available at your usual multinational conglomerate retailer. I received this book from Blogging for Books for this review.